From the San Fernando, Conejo and Simi Valleys to the Westside! 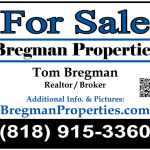 Bregman Properties is a Boutique Full Service Real Estate Office We pride ourselves on providing unsurpassed service and representation to real estate buyers and sellers in the greater Los Angeles area from the Westside to the tri-valley areas. We look forward to working with you in the San Fernando Valley, the Conejo Valley, the Simi Valley and the greater Los Angeles areas. With real estate offices located in Oak Park and Reseda, we are able to provide personalized service to you, our valued client. Traditional Sales, Foreclosures, Short Sales and Commercial Real Estate. Whatever your real estate need may be, Bregman Properties has an experienced real estate agent who is ready to represent you and insure that you achieve your goal. Whether you are buying or selling a standard sale, a short sale a bank owned foreclosure or a commercial property, Bregman Properties has an experienced agent who will help to make your real estate goal a reality! On behalf of Bregman Prosperities, I invite you to explore the resources available on this website and to contact me at any time. I am always available to you if you have real estate related questions, if you would like additional information, or if you would like to go take a look at a property. I look forward to working with you and to helping you achieve your real estate goals!